Emancipation & Liberation » TWO REVOLUTIONS? A resolution from Birmingham says: “The ‘Corbyn revolution’ has for the foreseeable future closed the electoral space to the left of Labour.” It has “unleashed expectations which can’t be met within the confines of the existing structures of the Labour Party”. This will spill onto the streets, in campaigns and communities. Like a whirlpool, this ‘revolution’ is pulling LU down the plug. There is no doubt that the movement led by Jeremy Corbyn took off during the election campaign. At the start Corbyn was under siege from the Tory press, his own backbench MPs, the BBC and the Tory election machine. By June 8 Corbyn had led a very effective campaign against Theresa May’s “strong and stable” leadership. Although the Tories got most seats, Labour had won the battle for hearts and minds. If the Scottish National Party vote had held up in Scotland, Jeremy Corbyn would now be prime minister. Instead of a rightwing coalition of the Tories and Democratic Unionists, we would, or could, have had a more social democratic coalition of Labour and the SNP. It was the unionist offensive in Scotland, led by the Tories and supported by Scottish Labour, that pushed back the SNP and kept Corbyn from Downing Street. The excitement and enthusiasm, which followed Corbyn all the way to Glastonbury, is a ‘revolution’ in hope. This is not to be disparaged. But we should not get carried away by the sight of JC walking on water or feeding ten thousand with a few fishes. Political revolutions overturn constitutions and politicise the class struggle. But the ‘Corbyn revolution’ has not overthrown the British constitution or even the constitution of the Labour Party. 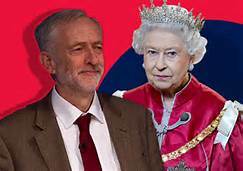 After World War II the Labour government established Britain’s social monarchy. Over the last 30 years the Elizabethan welfare state has been steadily privatised and handed to the market. Since the 2008 financial crash, the policy of austerity has squeezed it to death. Today its most potent national symbols – the queen, the NHS and the BBC – have been undermined or hollowed out. The destruction of the social monarchy began with the ‘Thatcher revolution’, followed by the ‘Blair revolution’, and supported by George Osborne’s ‘devolution revolution’. The ‘Corbyn revolution’ makes sense in the context of the struggle between neoliberalism and social democracy. Left social democracy opposes neoliberalism with reference to the 1945 Labour government, just as neoliberals accuse Corbyn of dragging us back to the ‘dark’ days of the 1970s before the Thatcher ‘revolution’. The Labour manifesto is about restoring the social monarchy by investing in the public sector and redistributing income. The means of carrying this out is by Labour winning a parliamentary majority and becoming Her Majesty’s government and working within the laws and institutions, based on the sovereignty of the crown-in-parliament. Whilst the impossible and unbelievable has now become likely, it does not constitute a ‘revolution’. Something else is brewing. The tectonic plates of UK politics are shifting under our feet. We can even find smoke signals coming out of the Labour manifesto. This identifies the UK’s “democratic deficit”. It calls for federalism, an elected House of Lords and even a minister of the crown for England, to plug the constitutional vacuum here. But the main demand is for a constitutional convention to discuss a new constitution. Had the general election been conducted by proportional representation (a little known Left Unity policy), Corbyn would now be moving his jam jars into 10 Downing Street. The LU conference went further and voted for a resolution saying, “we are committed to internationalism … and democratic revolution”. A resolution from Wigan and South London went further in support of democratic revolution both in Europe and the UK. Democratic revolution is a process, not a theory, even if we need theory to understand it. It begins with society recognising a ‘democratic deficit’, out of which grows a ‘crisis of democracy’ and a democratic movement. We can see this process currently underway in Hong Kong. In the UK the ‘democratic deficit’ is a slow burner, long recognised and practically ignored, except in Ireland, Scotland and Wales with the new devolution settlements after 1997. This settlement was disrupted by the 2008 banking crisis and recession. The 2014 Scottish referendum was the first breach in the wall. The insurgent Scots were repelled. In 2015 the SNP brought up more artillery, as 52 Scottish MPs began pounding Tory unionists in Westminster. In 2016 the ‘democratic deficit’ widened, when England and Wales voted to leave the European Union, as Scotland and Northern Ireland voted to remain. It put national self-determination at the heart of the European debate. The ‘Corbyn revolution’ is not a programme for democratic revolution or indeed any revolution. If anything, it is the last attempt at restoring the post-war social contract through a bankrupt two-party political system. It is nevertheless massively significant as skirmishing in the foothills of the democratic revolution. It is part of a ‘crisis of democracy’, as young people try to find their way out of our constitutional prison by first trying to open all the doors.